Click here for upcoming lectures! Click here to order your signed copy! We give lectures and tours of Detroit! Click here!! After four years in publication and eight press runs, we would like to thank those who have made the book a great success in bringing awareness to Detroit's architecture! Architecture critics sometimes get so immersed in the jargon of their trade—entablatures and plinths and the like—that they forget that buildings get built for fleshand- blood people. 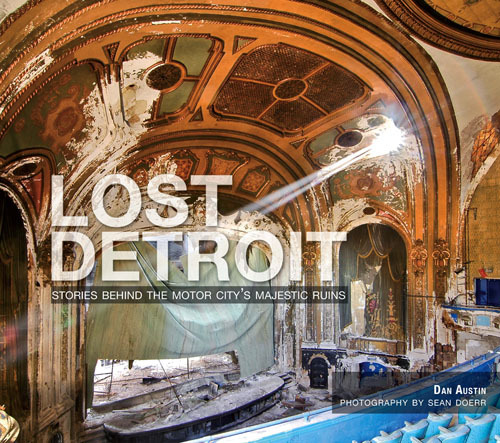 In this important book, Dan Austin and Sean Doerr have restored the real people to many of Detroit’s architectural landmarks, and not a moment too soon. The “lost” buildings of their title still stand, or rather totter, in a dilapidated state, their histories fading like the paint on their walls. The buildings themselves may not long survive. But thanks to this book and the efforts of Austin and Doerr, the stories of these buildings, and the stories of the people who built them and used them, will endure. Who were these lost Detroiters? Mayors and matrons, train conductors and auto workers, honeymooners and jitterbugging young couples out for a Saturday night—all the rich panoply of faces that make up Detroit’s story. The buildings they inhabit in these pages—the Michigan Central Station, Vanity Ballroom, Cass Tech High School and others—held a central place in the story of Detroit’s Auto Century. It was America’s story, too. Detroiters lived, loved, toiled, played, celebrated and dreamed great dreams in these buildings and thereby helped shape a nation. This book is blunt about the deterioration of these landmarks. But the reader need not fear or expect another of those dreary celebrations of ruins that came into vogue a few years ago. These structures stand today as ghost buildings, to be sure, and some of the photos may make you cry. But more often, the photographs here will have you staring in wonder at the splendor and the plenty of what once was. So don’t worry if you think architecture is beyond you, or if you don’t know a frieze from a fresco. Austin and Doerr are good guides, gently leading the uninitiated through many rooms and hallways of Detroit’s all-but forgotten story. It’s a fascinating journey, well worth the price of a ticket. Click here if you would like to book a tour or lecture. Copyright (©) Dan Austin and Sean Doerr 2010-, All rights reserved.